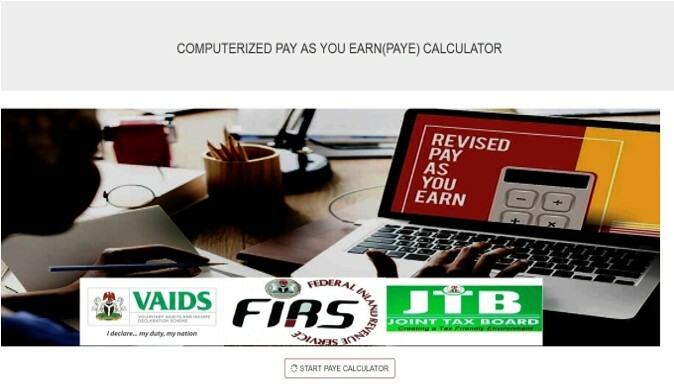 A Computerized Pay As You Earn (PAYE) system is a computerized method of income tax computation under which employers calculate and deduct any income tax due each time a payment of wages, salary etc. is made to an employee. This study will aid handle general tax administration from registration, assessment, and PAYE calculations. Its intended purpose is to reduce the cost of the tax payer complying with International Tax Regulatory Body (ITRB), increase tax collection and remove the inefficiencies associated with costs of movement by tax payers to the government. The System is developed with HTML, CSS, BOOTSTRAP, MYSQL and PHP technologies. The have been an advocate for the use of tax as an instrument of social engineering, to stimulate general or sectorial economic growth. In that regard, taxation could have a positive or negative effect on both the individual and on government. To the individual, low income tax rate constitutes an incentive to work or save, while high income tax rate represents a disincentive to work or save. To the government, high tax rates provides the most reliable, important and dominant source of government revenue, for promoting the economic development of the nation. The tax rate is often a major consideration in the choice of organizational form of business and may also be associated with varying levels of foreign direct investment. According to Burgess and Nicholas (1993) Income tax is a tool to achieve economic growth in any country. Income tax is accepted not only as a means of raising the required public revenue, but also as an essential fiscal instrument for managing the economy. Problems of taxation have been receiving special and increasing attention in recent years. Presently, in Nigeria, because of paucity of resources that can be obtained from oil and from domestic borrowing, Nigeria government needs to increase its tax revenues in order to achieve macroeconomic objectives. The financing of the social security benefits such as health, security and provision of utilities draws heavily upon income that otherwise would have been saved. Instead of accumulating capital, this income goes to social security transfers which are probably consumed. These burdens have pressed the government to continue pursuing its tax reform agenda since revenue generating from oil has diminished which turned taxation as the major source of financing the budget. Taxation provides governments with the funds needed to invest in development, relieve poverty and deliver public services. It offers an antidote to aid dependence in developing countries and provides fiscal reliance and sustainability that is needed to promote growth. Tax system design is also closely linked to domestic and international investment decisions, including in terms of transparency and fairness. Strengthening domestic resource mobilization is not just a question of raising revenue: it is also about designing a tax system that promotes inclusiveness, encourages good governance, matches society’s views on appropriate income and wealth inequalities and promotes social justice. Taxation is integral to strengthening the effective functioning of the state and to the social contract between governments and citizens. By encouraging dialogue between states and their citizens, the taxation process is central to more effective and accountable states. Reforms which begin in tax administration may spread to other parts of the public sector. Having a computerized PAYE calculator is a positive step moving towards simpler, more equitable and transparent tax systems for developing countries. To resolve the issue of manual computation and assessment of income tax. 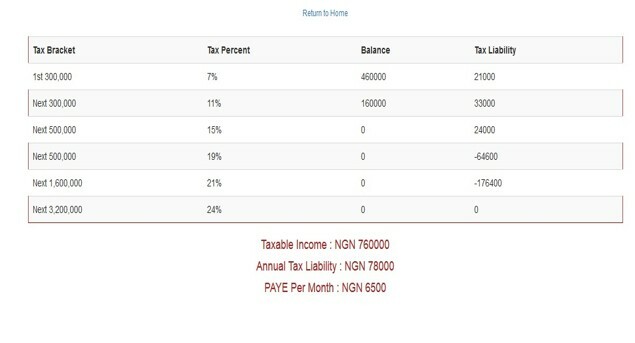 To design and implement a system that will compute Annual Tax Liability using the current Personal Income Tax Act Cap P8 LFN 2011. Inaccurate Personal Income Tax Assessment is a major challenge contributing to High tax evasion/avoidance in developing countries (Russell, 2008). Employers/Employees fail to file in returns or end up paying less to the Government because, of inadequate information about how much to be returned to the government, also feelings of hopelessness from employees since they aren’t charge as they earn further compounds the problem. The study will aid employers/employees calculate amount to be paid as they’ve earned, solve the tedious work and activities in calculating amount to be paid, in which they end up mis-calculating and discarding some important figures. 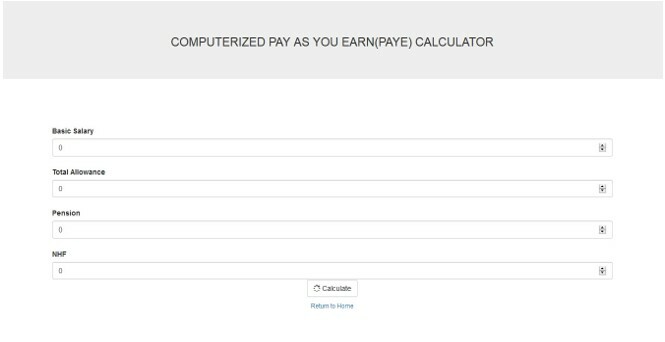 With this PAYE calculator, employees can now calculate their Tax with just a click away with payment options. - PAYE – Pay as you earn. - Tax - a mandatory financial charge or some other type of levy imposed upon a taxpayer (an individual or other legal entity) by a governmental organization in order to fund various public expenditures. - Government ­- is the system or group of people governing an organized community, often a state or Country. - Calculator- used for making mathematical calculations, in particular a small electronic device with a keyboard and a visual display. - Employees - a person employed for wages or salary, especially at non-executive level. - Payment- the action or process of paying someone or something or of being paid.